Winter hardy to USDA Zone 7 where it is easily grown in average, moist but well-drained soils in full sun to part shade. Appreciates part afternoon shade in hot summer climates. Apply a thick winter mulch in areas near the northern edge of the growing range to protect the root system. Shrub stems will typically freeze to the ground in winter when temperatures dip below 15 degrees F, but new stems will likely rise up from a protected root system in spring and rapidly grow back to as much as 6’ tall by summer. Whether or not winter stem freezing occurs, plant appearance can often be greatly improved by a late winter pruning of stems to as far back as 6-12” from the ground without fear of flower loss because flowers appear on new growth. Leycesteria formosa, commonly called Himalayan honeysuckle, is a multi-caned deciduous shrub in the honeysuckle family that typically grows to 3-6’ tall. It is native to forested areas of the Himalayas and southwestern China. Hollow, bamboo-like, upright, powder-gray stems are clad with opposite, undivided, long-pointed, cordate-based, ovate dark green leaves (to 2-7” long). 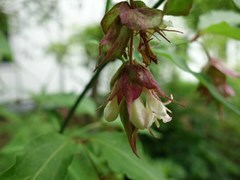 Small, mildly-scented, white honeysuckle flowers, subtended by showy deep red bracts, bloom throughout summer (June – September) in terminal and axillary pendulous racemes. Flowers are followed by small fleshy edible purple berries which purportedly taste like toffee or caramel. Genus name honors William Leycester, Chief Justice of Bengal c.1820. Specific epithet from Latin means handsome or beautiful. Sometimes commonly called pheasant berry in England because pheasants love to eat the fruit. Specimen or in small groups for woodland gardens. Dappled shade. Whistles can be made from the hollow plant stems.